National Trail Local Schools will be holding a School Security and Safety Presentation on Wednesday, April 18, from 6:30-8 p.m in the National Trail Cafetorium. All National Trail parents and community members are welcome to attend. NEW PARIS — National Trail Local Schools will be holding a School Security and Safety Presentation on Wednesday, April 18, from 6:30-8 p.m in the National Trail Cafetorium. All National Trail parents and community members are welcome to attend. The public is welcome to submit questions to be answered during the forum. Superintendent Jeff Parker is asking for those with questions to submit them at NTSchoolSafety@nationaltrail.us by Tuesday, April 17. There will also be an opportunity to submit questions at the meeting. Potential topics include: Building Security, Safety/Security Practices, School Resource Officers, Mental Health, Staff Armed Responses, Staff Training, Safety and Security Assessments. “The reason that we are planning this, is because we talk about school safety all the time and we have actually been looking at some different possibilities for 18 months now, but certainly what has happened at the national level has spurred that. We also did not want to have a knee-jerk reaction, but we want to let the school community know things that National Trail has been doing throughout the year, but we also want to get input on some future school safety possibilities,” Parker said. The questions which are submitted prior to the meeting will be answered for the public, but there will also be an opportunity for the community to write questions on note cards and submit them during the meeting. If those questions are not answered, there will be follow up. The intention of this meeting is to further inform the National Trail Board of Education as they make safety decisions moving forward. “We plan to have somebody there to go through the questions that are submitted at the time to make sure there are no duplicates and that they are going to the right area,” Transportation and School Safety Director John Toschlog said. Questions asked during the meeting must be submitted on index cards. The intention is to answer those at the meeting, but the email will still be open to submit questions for a time following the meeting, so the community can reach out with any followup questions. According to Parker, he observed this format at another meeting and found it successful. 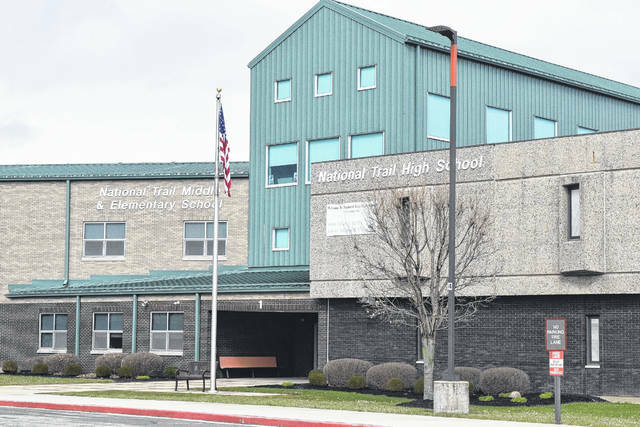 https://www.registerherald.com/wp-content/uploads/sites/41/2018/04/web1_NT.jpgNational Trail Local Schools will be holding a School Security and Safety Presentation on Wednesday, April 18, from 6:30-8 p.m in the National Trail Cafetorium. All National Trail parents and community members are welcome to attend.